Sometimes I get homesick. It is nothing to be embarrassed about, is it? I know, I am an adult who’s been living in a foreign country for 6 years and should be tougher. And I am doing my best but from time to time I just want to be around my family and eat a nice Polish dish. 2. 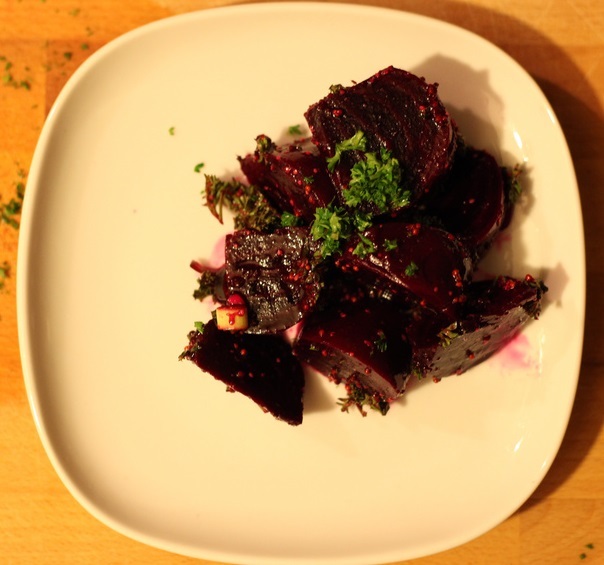 Peel the previously cooked beetroots and chop them into little pieces. 3. Chop your pumpkin into little pieces. 4. Add all ingredients into a big plastic bowl and toss them. Add all spices, lemon juice and oil. Make sure everything is well mixed. 5. Leave everything to roast in the oven for 20-30 minutes. Before eating sprinkle some fresh parsley. It’s not that difficult, is it. The preparation of the salad shouldn’t take you longer than 5-6 minutes. The salad can be served with red meat if you’d like (or just with a glass of red wine). (Un)necessary souvenir from Istanbul, Turkey. Eating out in Lisbon: how not to get ripped-off.